Happy 103rd birthday, Beverly Cleary! 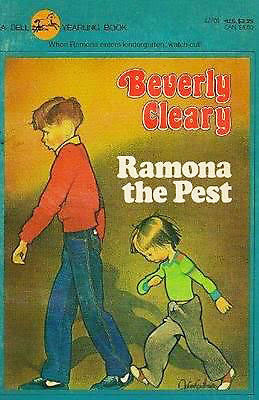 In order to celebrate your birthday, I dug my tattered and torn paperback Ramona the Pest out of a box at my Dad’s house and began reading it to my 5- year-old son. As we snuggled before bedtime and laughed at all of Ramona’s antics during her first months of kindergarten, I remembered how much I appreciated your stories when I was a child. You really seemed to understand how puzzling the adult world can be to a little girl. I recall feeling relieved as I read how Ramona also threw fits to get what she wanted, felt frustrated when adults were distracted, and sometimes was so angry that she pounded her feet on her bedroom wall and reveled in the fact that her oxfords left scuff marks on the walls. Now, I read your books and remind myself that children are complex little people with real feelings who are simply trying to figure out a world in which they are the smallest and the most impatient. Beverly Cleary, thank you for creating Ramona, Beezus, Willa Jean, Howie, and the rest of the children in and around Klickitat Street. Your writing shaped and enlivened my childhood. Currently, your insights on parenting and the relationships between children and adults still shape many of the interactions I have with my young son and my pre-kindergarten students. Now that I am a “slowpoke grown-up,” I try not to say things like, “You are shooting up like a weed” or “cat got your tongue?” to my small students. I try to be an understanding grown-up who remembers being a girl, with straight brown hair like Ramona, with the potential to be a bit of a “pest” and who sometimes wanted to throw a “big, noisy fuss” when she was the youngest one in the family and was not always taken seriously.